ALOR SETAR: The family of Muhammad Haziq Mohd Tarmizi, 17, who died in the random shooting incident at a mosque in Christchurch, New Zealand last Friday, accepted news of the youth’s death in a calm manner. 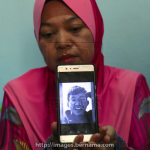 His auntie, Zarina Shuib, 53, said that during the video call with family members who were in Christchurch, she could clearly see their situation there who could speak calmly despite having just lost their loved one. “Just don’t know how his younger brother, Haris (Mohd Haris, 12,) would react because until now they (Haziq’s parents) did not want to inform him that his elder brother had died. “Even during the video call just now, I did not see Haris clearly because he appeared to avoid talking, he went away (when the handphone was given to him), he is still in a traumna,” she told reporters when met at her home in Hutan Kampung, near here today. She said she only knew of the death of Muhammad Haziq, 17, early this morning as he was getting ready to go to work. “At 8 am today, my younger sister (Mariani Shuib) said that Haziq had gone, but it had yet to be confirmed. An hour later, she was again contacted and told that Haziq’s death had been confirmed. “Subsequently, they made arrangements for Haziq’s funeral and I was told that only my younger brother (Mohd Tarmizi Shuib) and elder brother (Zakaria Shuib) were allowed to be at the burial ground and everything was over about 2.30 pm New Zealand time,” she said. Asked on the condition of Muhammad Haziq’s remains, Zarina said her nephew was hit by two bullets on the body, but his looks appeared clean and without injury. “Adik Mariani said they all could kiss Haziq before being taken to the burial ground, Haziq’s appearance was clean, smiling and the body was not affected at all despite being dead for almost a week. “The family is relieved, eventually everything is over. Of course, we are deeply saddened by Haziq’s death, especially since we had not seen Haziq for a long time, but we are grateful that he was eventually found,” she said. Meanwhile, Zarina said Mohd Tarmizi’s health had improved and her youngest brother had been allowed to leave the hospital. She said her family members were discussing to hold a ‘tahlil’ session for her nephew. She also thanked the government which had rendered much assistance to her family in New Zealand. Family accepts Haziq’s death calmly 0 out of 5 based on 0 ratings. 0 user reviews.